Voices of Afghanistan is a traditional Afghan musical ensemble showcasing some of the finest musicians from Central Asia and Afghanistan. 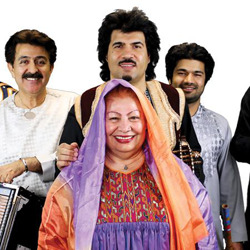 Legendary Afghan songstress Ustad Farida Mahwash is accompanied byrubâb master Homayoun Sakhi and The Sakhi Ensemble, specializing in both in the rich traditions of Afghanistan and its neighboring lands and in bold contemporary works. Homayoun Sakhi, the group’s musical director, has devoted his life to studying the rich music of his region and has emerged as one of its greatest living composers. A performance by Voices of Afghanistan is a journey through time and space, reprising the glories of the Afghan past and reaching all the way to its increasingly global contemporary life and expression.